Washington, DC March, 7 2010. “If you are a priest, and walk along the street in your cassock, then you must always be prepared for the fact that someone may turn to you for help. You must always have something, which you may give away to someone in need.” ~ As told by Father Gregoire Legoute, on Orthodox life in Haiti. Being one of the poorest places on earth, it is difficult for a parishioner in a country like Haiti to support a priest, his family and his parish. For this reason, a priest is required to go outside of the church, in order to feed his family, and in turn, support parishioners in need. Haiti currently has two priests: Father Gregoire Legoute, and Father Jean Chenier-Dumais. They are both schoolteachers. There are three schools currently assigned to the Orthodox Mission in Haiti. They are government certified, and sustained in part by Mission funds, and in part by tuition paid by parents. Two such schools operate out of Haiti’s capital city, Port-au-Prince. The House of Mercy School is run out of the Saint Moses the Ethiopian Church, and it is a special needs school for developmentally challenged children. This is one of six such special needs schools in Haiti. They are headed by Father Gregoire Legoute and his wife, Matushka Rose Legoute. Prior to the earthquake, in a school of 153 students, only six of them lived on the school premises near the priest and his family, while the rest made their way home after their studies ended at four o’clock. Today, the School of Mercy lies in ruins and is in need of rebuilding. In the church of Our Lady of The Nativity of the Mother of God, was a school for youngsters, directed by Father Jean Chenier-Dumais. It too, now, is utterly destroyed. In the church of Saint John of Shanghai and San Francisco in Le Cayes there is also the Saint Chrysostom school. Of highest priority to the Mission, Father Gregoire considers the rebuilding of the school houses and the buildings where liturgies were served, as they too suffered significantly as a result of this catastrophic event. Currently Haiti has a population of roughly 3,000 Orthodox Christians. They compose seven parishes, across six departments throughout the country (there are 10 departments in Haiti, in all). They are, the parish of Saint Augustine of Jacmel , the parish of Saint John of Shanghai of Les Cayes, the parish of Saint Nicholas in Cape Haitien, the parish of Saints Peter and Paul in Leogane, the parish of the Nativity of the Holy Theotokos in Port-au-Prince, the chapel of Saint Moses the Egyptian in Fontamara (Port-au-Prince) and the community center of Saint Irenaeus of Lyon in Maissade. For all of this area, and for all of these faithful, there are but two priests. Communities are gathering in rented houses that the churches have provided. For the time being, there are no buildings that appropriately fit the architectural criteria of a church ‘structure’ in Haiti. At least earlier, there existed the cathedral of Saint Augustin in Jacmel. But, as a result of the Schism, former Mission administrator, Father Gregory Williams left the church, taking with him all of the associated documentation for this building, thereby denying Orthodox Haitians of its use and existence. 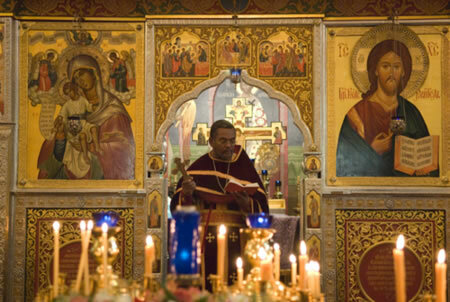 Now these Orthodox Christians are forced to cram themselves into the tiniest of quarters, where it is virtually impossible to fit some 600 people. This earthquake obliterated the Leogane church of Saints Peter and Paul in its entirety. Similarly, the church of the Nativity of the Holy Theotokos in Port-au-Prince, as well as the chapel of Saint Moses of Murin in Fantamar lie in ruins and need to be rebuilt.